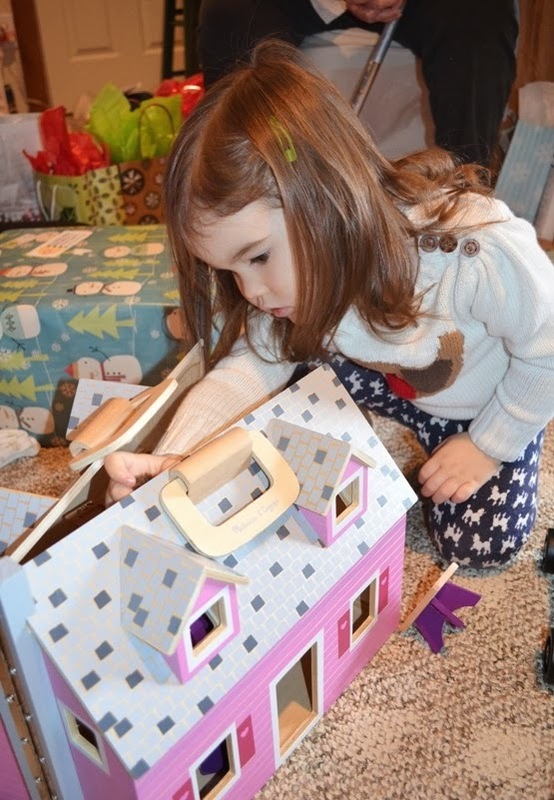 No, not that kind of house... We got Johnnie the Melissa & Doug Fold & Go Dollhouse for Christmas. It is so dang adorable I can barely stand it. Also I am kind of jealous. Her new house came in the mail, fully furnished, and she didn't have to lift a finger. (Although she's very particular about where each piece of furniture goes.) As for us, the pipes froze and burst in our house's basement over the weekend, and the next two days are supposed to be the coldest on record in 20 years. While frozen pipes used to be a regular occurrence, we haven't had any problems in a couple of years, so this was majorly discouraging -- especially as we're still in the final push to "finish" the house. I am having daydreams of apartment living -- no maintenance, no fuss, doorman, etc. However, when we finally move into our master suite it will be a lot like moving into an entirely new house with a new outlook. That is a happy and hopeful thought that I continue to hold onto for encouragement. News: Our appraisal is scheduled for next Monday, one week from today. Please pray for no more setbacks, and that we can get the last To Dos checked off the list without a hitch this week. There's not much left! Really! I almost can't believe it. Please, house, be kind to us! Okay, so back to Christmas. Johnnie is just so sweet. 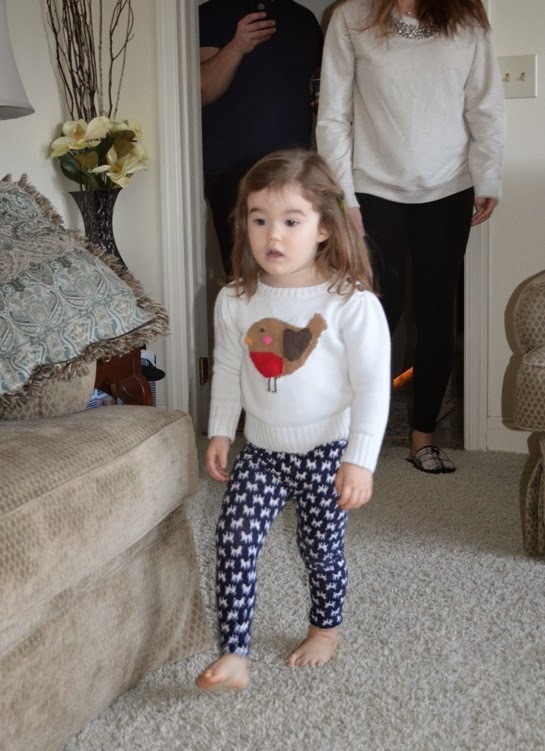 This was her expression when she saw the filled stockings hanging on her grandparents' fireplace on Christmas morning. I loved how she found joy in every little thing all day (and always). She is the best. 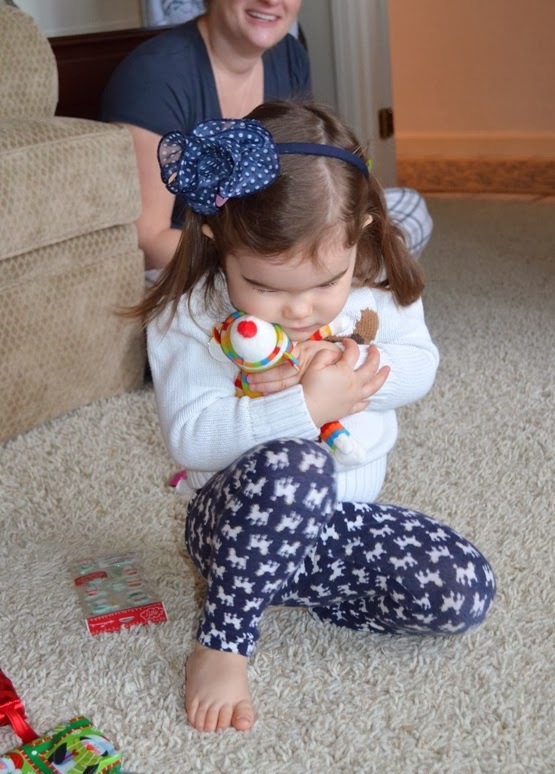 We tried to keep the holiday simple by getting her only a handful of gifts, but she came away with quite a haul (including that new headband and instantly beloved striped Beanie Baby monkey) thanks to doting grandparents and aunts. She's not hurting for love and attention, this one. 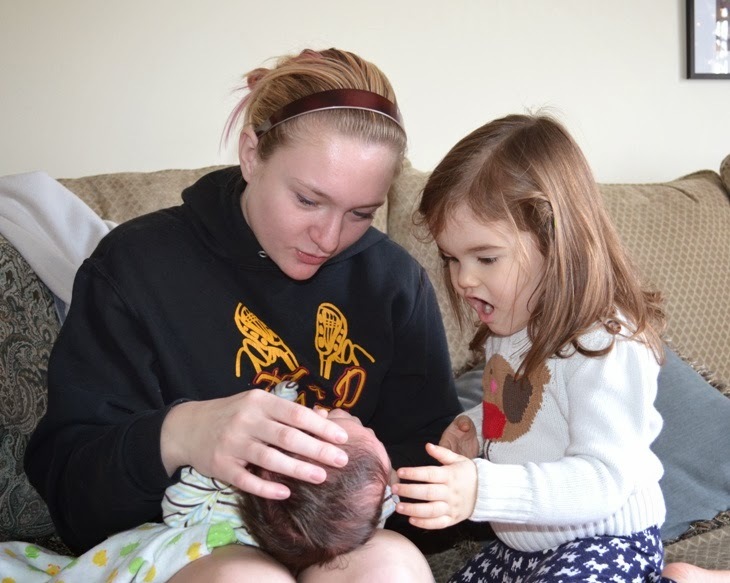 Her favorite part of the day, though, was meeting her newborn cousin for the first time. Ez's older sister and her husband drove through the night on Christmas Eve, all the way from Chicago with a newborn and a two-year-old, to surprise us on Christmas morning and to be with the family during the preparations and memorial services for Pop (Ez's grandfather who passed away earlier in the week). There wasn't a dry eye in the place when they pulled in, and it made Christmas so special. As for Johnnie, she has never met a baby (living or plastic) that she doesn't want to hold, pet, coo over and mother. Anyway, I know things have been very quiet on this blog lately, but trust me: our lives have been anything but. We've crammed so much joy and mourning and work and activity into the past three weeks that I'm still trying to get my footing in 2014. I hope you're all faring well in this new year, staying warm and working well toward your goals. This year is going to be a doozy, I can feel it.